He decides to hunker down for the night there and rest. When he wakes up he’s in Mississippi. Whut… really? I mean really really? Did the writers completely run out of ideas of how to actually get Morgan away from the rest of the cast? He stocks up on some supplies, examines some maps, uses the toilets and is interrupted by Wendall, a Black man in a wheelchair with a shotgun who wishes to discuss him using the disabled stall. He is joined by Sarah, a white woman, and they introduce each other as twins with a “yeah we know it’s not true but you don’t need to know” look. They seem a little surprised that he spoke to someone on the radio but lay out their spiel - they’re truckers. And when the zombie apocalypse hit they were perfectly placed to know where all the warehouses where, to know their way around the roads, where to find petrol and generally able to move supplies around to where they’re needed easily. Which sounds pretty awesome. But we’re not running with that, yet anyway. So Jim is a brewer. He makes beer. And he was kidnapped by people who wished to punish him for the heinous crime of inflicting American beer on the world steal his recipe. Jim’s really big about making beer bragging about his awards and his plans for the future - basically make lots of beer and hope the world sorts itself out so he can sell beer. Which… I mean his point that humans will infest the planet in time has merit because humans are worse than cockroaches for that… but I think it’s going to be a while before we get a market economy up and running. Because this is The Walking Dead and all good deeds and decent people must be punished because it’s BLEAK AND HOPELESS! REVEL IN THE BLEAK! THERE WILL BE NO HOPE EVAH! In case we’ve missed it. 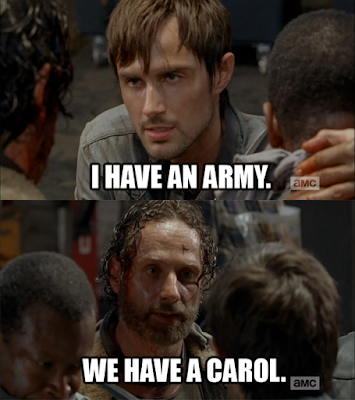 So Wendall and Sarah want to go to Alexandria because… why? I mean, seriously why? They’re thieves and scammers so there’s a decent chance they won’t be welcomed. They seriously do not have the forces necessary to overcome it. Why is Morgan even worried about taking them there? 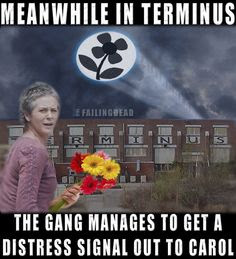 They’re going to arrive, meet Carol, be invited to look at some flowers and then die a terrible terrible death. They’re not a threat Morgan. Maybe it’s the Saint Morgan thing. 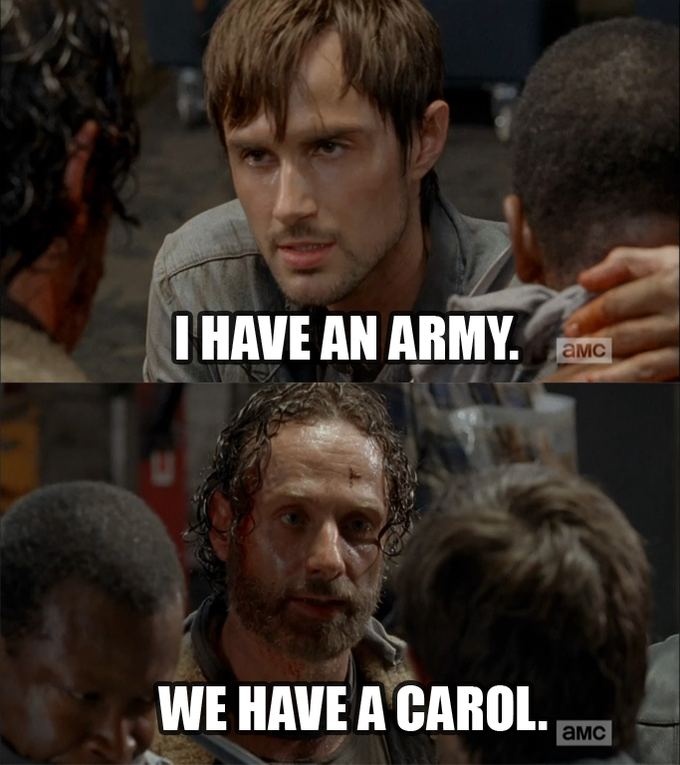 I mean he’s not trying to protect Alexandria, he’s trying to save them from the vicious Carolling in their future. So they take him captive and demand he tell them the way while they drive to Virginia. He says no. Jim gets on board because he needs a settlement to sell his booze and he’s really that obsessed with beer. He actually has a really good beer speech and how beer is a fundamental to a rising pre-modern-technology civilisation. And he’s not wrong. Except a) not American beer. The apocalypse is bad enough and b) beer is a safe source of drinking water only in societies that don’t know about germs and boiling water. They make a stop because the truck is now magically too heavy. This truck that drove from Texas. In a hurricane. Is now too heavy. 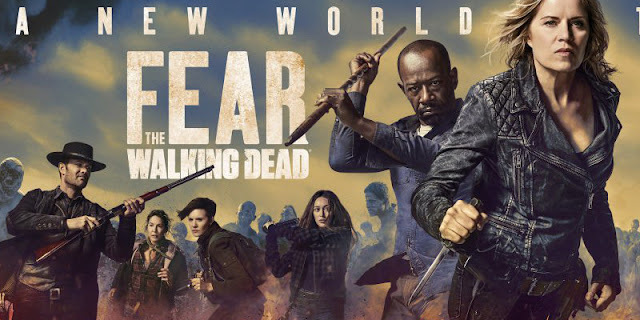 This leads to a convoluted state of affairs in which Morgan ends up trapped on top of a car surrounded by zombies with his arms tied and Sarah and Wendall insist he tell them the location of Alexandria if he wants to be rescued. He agrees and they abandon him. He protests they point out he can drop the holier than thou act because he did the same thing with his friends when he lied about the bridge being out. Yes they knew. Why he thinks any of them are invested in him being a better person I do not know. He manages to free himself thanks to those aforementioned caches the old Texan lorry driver was leaving behind. One happened to be within easy reaching distance of the car he was stuck on. This is, what, the third or fourth really convoluted and helpful event in this episode?. Remember how Gabriel briefly thought he was being guided and protected by god? Well Morgan might actually be. And the others have come back because he was lying about the direction to Alexandria. So he’s not that much a fool. He agrees to show them the way - buuuuuut he has a condition now. He’s all guilty about being a bad person so now he wants to go back to Texas, leave supplies dotted around everywhere and rescue his friends. Oh and the guy they stole the truck from. The rest have to come with him because if they want to go to Alexandria what choice do they have? (Morgan is not an easy man to overpower). Also there's raaaaaather a lot of characters now who aren't extra and they're all over the place... who is next to die?